October has arrived and, thank goodness, so have the cooler temperatures. September was unseasonably warm in Michigan and it feels so nice to finally break out the cozy layers. 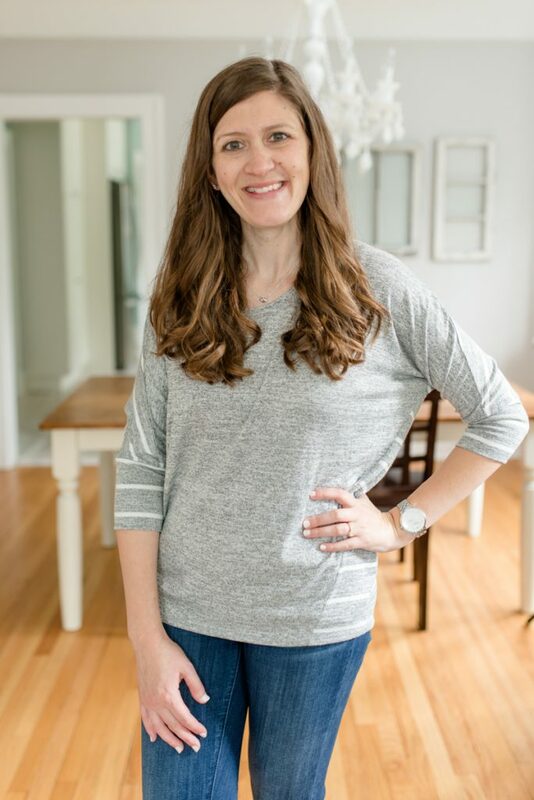 My October Stitch Fix shipment was perfect for the fall transition and I am happy to report that my stylist Jenn is starting to figure out a little more about me, my personal style, and my wardrobe needs. 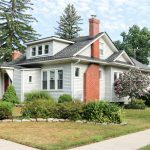 This really was a great fix and a fun one to share on the blog. This post contains affiliate links, as well as my Stitch Fix referral link. 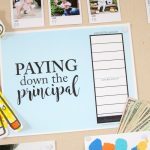 We earn a small commission each time someone signs up for Stitch Fix or makes a purchase with one of our links, which helps to support the blog. I know you've heard me talk about Stitch Fix a million times before. This is my 64th shipment from them and the reason I keep getting fixes in the mail is because the service is that good. I love how convenient it is to complete my style profile online and schedule a fix. From there, my personal stylist reviews all of my clothing and size preferences, then hand picks 5 items just for me and ships them to my door. I love that I can request specific types of clothing (like clothes that pair perfectly with leggings or a mini capsule wardrobe) and she will try her best to send exactly what I need. 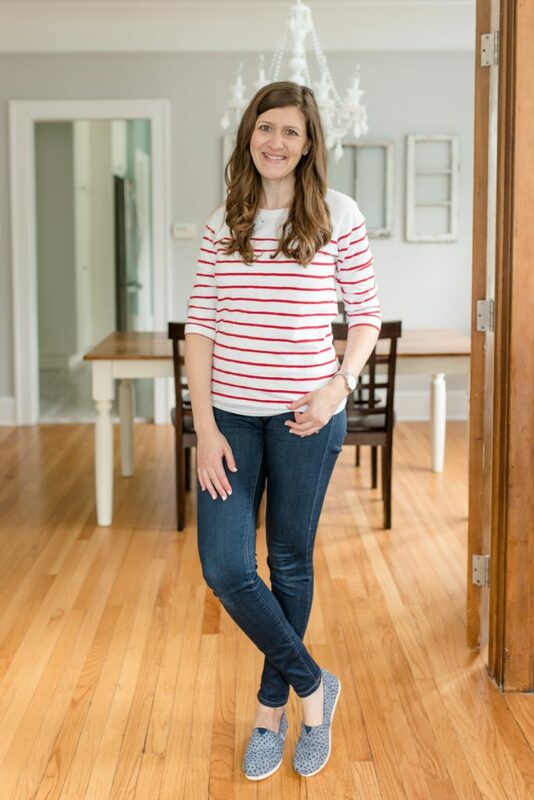 Stitch Fix also offers specialty styling services – including petite, plus and maternity styling. I've done a lot of research on other online styling services and no other company can touch Stitch Fix in diversity of people and body types that they serve. Stitch Fix also offers menswear through Stitch Fix Men – which recently expanded its offerings to include Big & Tall sizing. The menswear collection also includes extended tailored clothing from brands you know and love (such as Polo Ralph Lauren, Bonobos, Tommy Hilfiger, and Calvin Klein). As if that wasn't enough, Stitch Fix Men also now offers performance wear from top brands like The North Face, Nike, and Adidas. 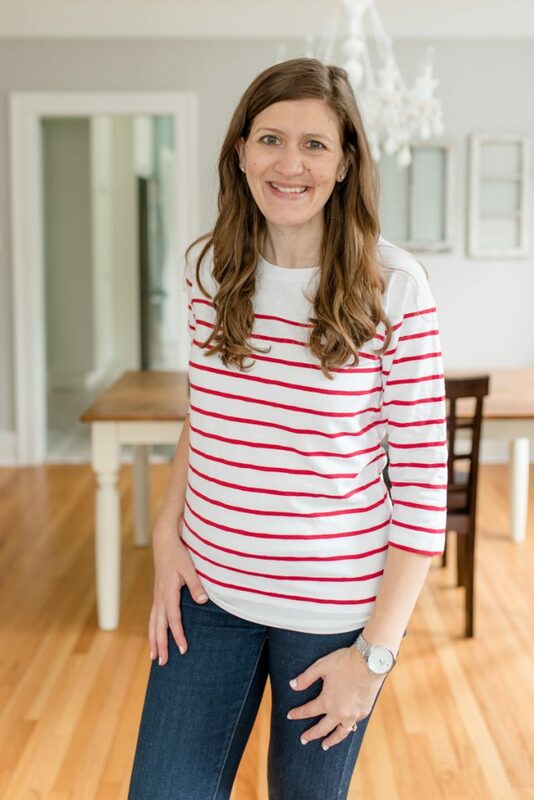 And now, with the recent launch of Stitch Fix Kids, even the busiest family can dress well with minimal effort. There are so many amazing reasons to use Stitch Fix, I'm amazed more people looking to simplify and remove time-consuming tasks from their life haven't tried it yet. If you're already a Stitch Fix customer, I have big news for you, too. 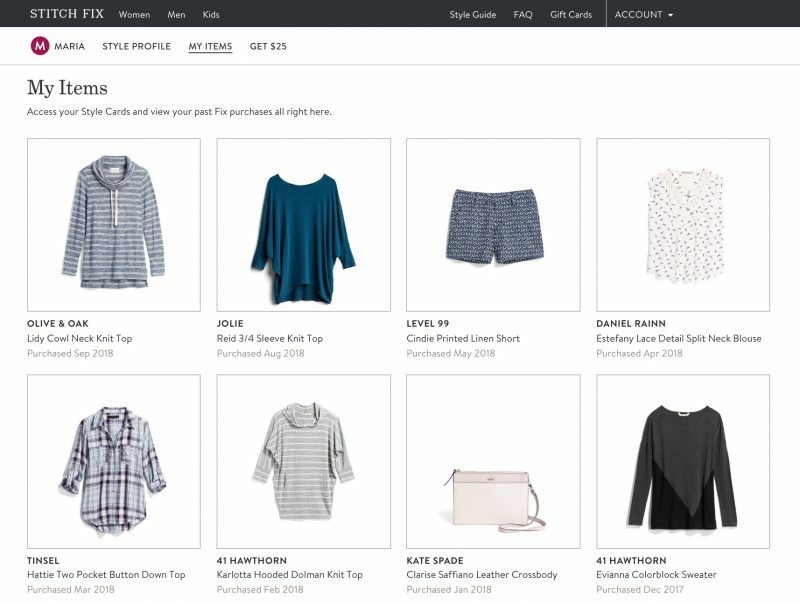 Your Stitch Fix account now shows every item you've ever purchased from Stitch Fix – with a photo, the brand, item name and the date of purchase. I can't tell you how excited I am about this feature! Stitch Fix is slowly rolling “My Items” out to their customers – I hope you have it already too! Right now, the information is only available when I access my account from a computer, but I know of several people who are also seeing the information in the Stitch Fix app on their phone. I love, love, LOVE all of these improvements and they're just more reasons to love this styling service. Now are you ready to see what arrived in my October Stitch Fix box? I decided to amp up the sweater's playful style and pair it with a classic pair of dark skinny jeans (these are my current favorite), my white Converse Shoreline sneakers, my Kate Spade watch and a simple silver knot necklace. I loved this outfit so, so much and was very tempted to keep the sweater. 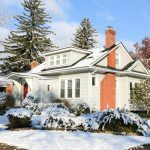 The only thing holding me back was that it felt like a perfect look for late spring or early summer – definitely not the crisp, cool weather of October. This top would have been guaranteed to sit in my closet for the next six months and I didn't want to purchase something that I wouldn't be motivated to wear until April. Sadly, the Breton Button Detail Knit Top was going back, but it was so much fun to try on. Ever since I spotted a pair of Toms Del Rey sneakers someone else's fix in a Stitch Fix Facebook group, I have been requesting a pair to try on in my own fix. They must be very popular shoes because the Del Rey style hasn't come my way yet. Last month, Jenn was able to send a pair of Cabrillo Canvas Lace Up Sneakers, but the black and white color scheme made them look like bowling shoes and I sent them right back. 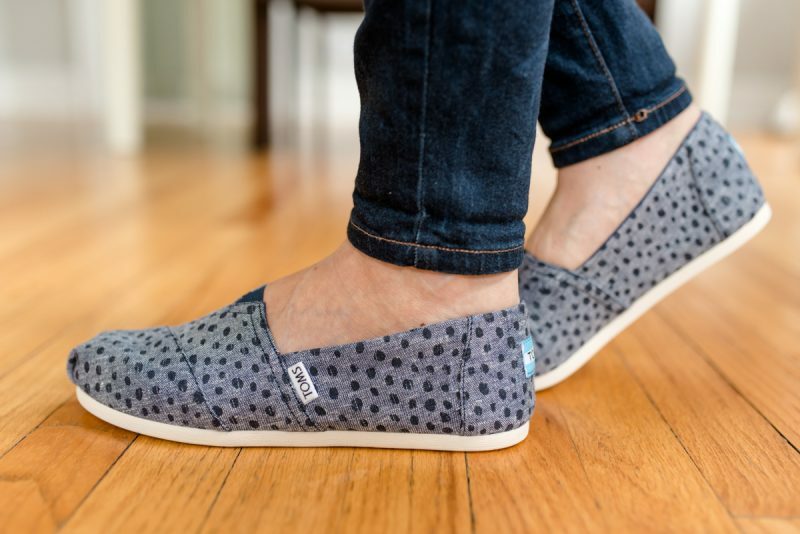 This month, Jenn still wasn't able to get her hands on a pair of Del Rey sneakers, but she did send a cute navy printed pair of Toms Classic Alpargata Printed Canvas Flat ($55). I've actually never tried on a classic pair of Toms before and I was curious to see how they looked on my feet, even if it wasn't the style that I requested. I especially loved the chambray coloring of this pair. The Toms were super-cute, but definitely too small. I somehow managed to cram my feet into them for a quick photo, but they were absolutely getting returned. Which is ok, because the shoes made my feet look long and skinny (which is what I expected and exactly the reason I had never tried on a pair of classic Toms before). I know a lot of women love their Toms (and my husband adores their new line of dress shoes – he even got a pair in his most recent fix), but the Classic Toms aren't for me. These were going back for sure. 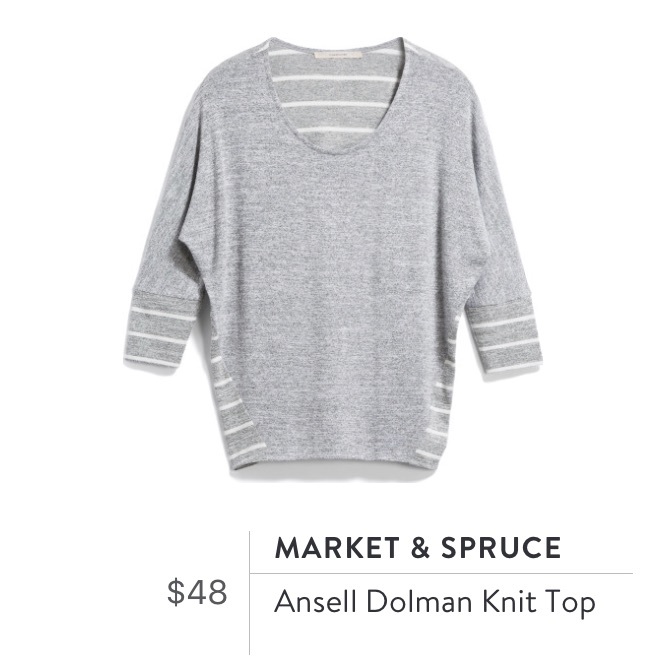 When I looked at the third item in my fix, a gray Ansell Dolman Knit Top from Market & Spruce ($48), I did a double take. It looked familiar. Really familiar. I honestly thought for a second that I had received the exact same top in a previous fix. 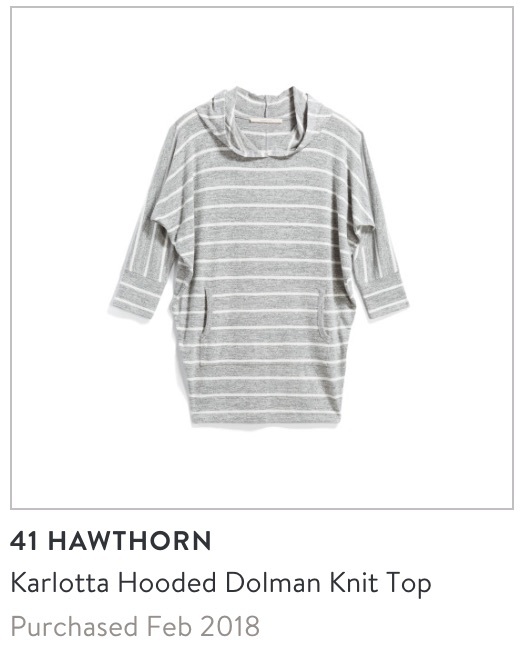 I dug around in the new “My Items” section of my Stitch Fix account and as it turns out, I had not received the exact same top, but the one I received this time around was incredibly similar to the Karlotta Hooded Doman Knit Top that came in my legging-friendly fix last winter. Even though the tops are different brands, they are both in-house Stitch Fix brands, so I'm pretty sure that even the fabric was the same. Truth be told, I preferred this newer Ansell Dolman Knit Top to my the gray and white stripe dolman knit top that is already in my closet. Hooded tops tend to feel a little heavy around my neck and I really liked that this top didn't have a hood. 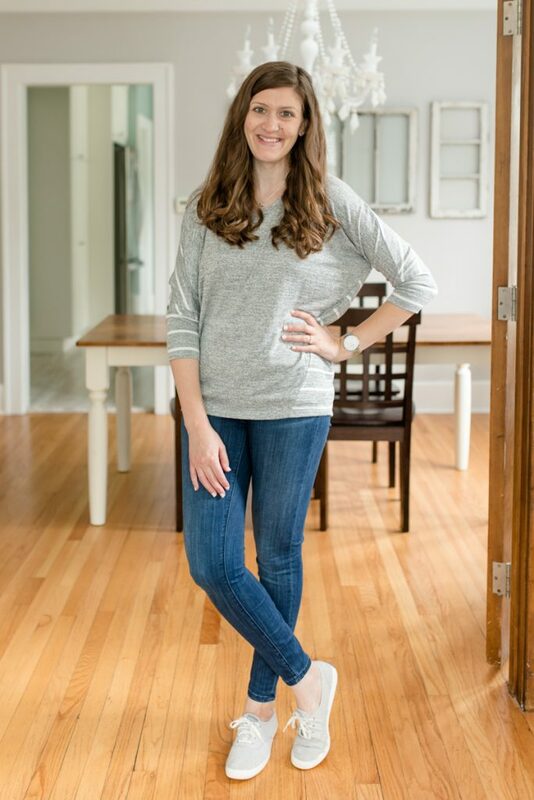 I styled the gray knit top with my silver Kate Spade watch, my silver knot necklace, the same skinny jeans and my gray Keds. Despite the fact that the Ansell Dolman Knit Top fit great and was perfect for my lifestyle, I couldn't justify keeping it. I ultimately decided to send this top back as well. The next item in my fix was W NK PWR HPR CROP from Nike ($60). These leggings were unbelievably comfortable. They put all the other leggings in my closet to shame because they were the perfect blend of comfort and compression. 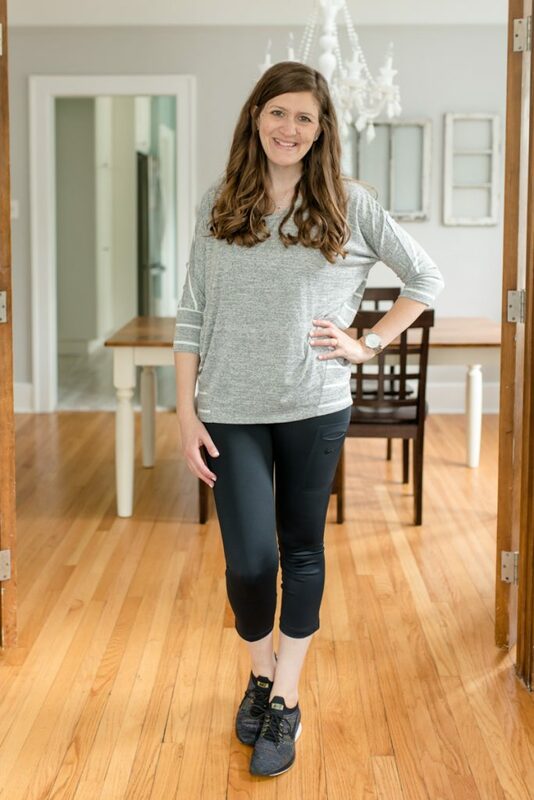 I felt like all my stomach was sucked in and smoothed out, but not to the point that the leggings were uncomfortable to wear or that the very top of the pants was digging in to my stomach – which happens a lot when I wear compression leggings. For the past several weeks, I've been trying to take a daily walk with Dessa to help get myself back in shape and get us both out of the house for a bit. Sometimes I push her in our new stroller and sometimes I wear her in our Ergobaby 360 carrier. No matter which way we travel, the walk is always brisk. I was so tempted to keep these because they would be perfect for our morning walks. I especially loved the built-in side pocket for carrying a phone. 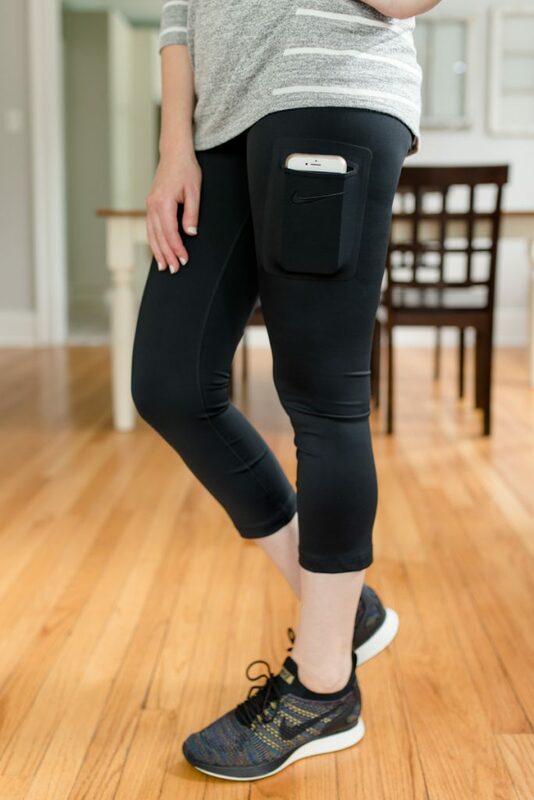 I often end up carrying my phone in my hand when I'm wearing my leggings on a walk. The built-in pocket would be such a great convenience. I ultimately decided to return the Nike W NK PWR HPR CROP. Once I had them on, I noticed they had a bit of a sheen to them – which was fine for working out or a daily walk, but they looked too “athletic” for the kinds of tops I always wear. Had I kept the leggings, I would have only worn them for my daily walk and then immediately changed into something else. It just didn't seem very practical. With only one item left to try on, I wasn't sure how this fix would end up. 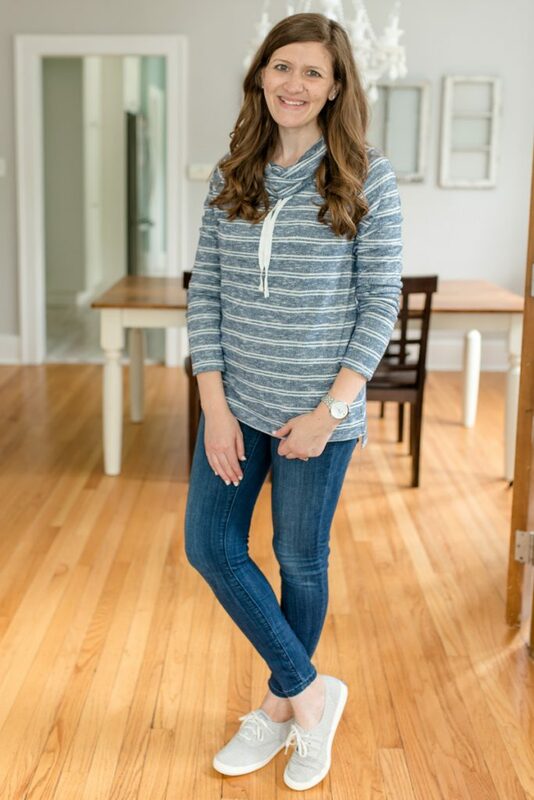 It was so promising, but here I was without any keepers and only one item left in my fix: a blue Lidy Cowl Neck Knit Top from Olive & Oak ($54). When I first saw this top in my Stitch Fix app, I wasn't exactly over-the-moon. It looked ok, but I wasn't exactly excited about about this particular sweater. 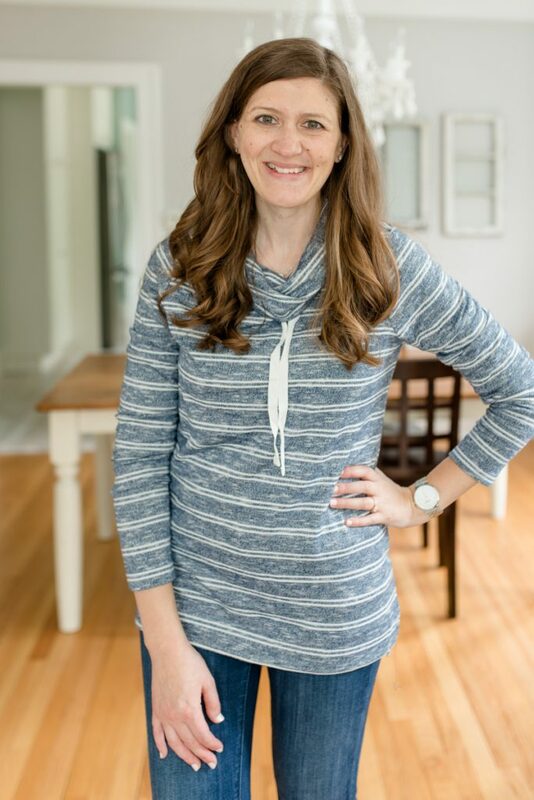 But I could tell that Jenn had selected the Lidy Cowl Neck Knit Top thoughtfully because it was neutral, casual and machine washable (three qualities I always appreciate and often request from my Stitch Fix clothes). I tried on the Lidy Cowl Neck Knit Top and instantly fell in love. I didn't realize how incredibly soft the top was until I was wearing it. The sweater was also the perfect blend of lightweight and incredibly cozy. It was the perfect top to pack for our first family vacation at Mackinac Island. Needless to say, this one was a keeper! I kept the styling very simple once again with my skinny jeans, silver Kate Spade watch, gray Keds and silver knot necklace. The best part of writing a monthly Stitch Fix box review is sharing a little of the fun with you! This month I'm happy to giveaway another $50 Stitch Fix gift card to one lucky blog reader. Use the Rafflecopter below for your chance to win! One last thing before you go! If you follow the blog often, you already know how much I love Stitch Fix. You may also know that I occasionally receive boxes from Trunk Club and that I recently discovered Wantable. There are so many great personalized style boxes out there, I plan to change things up a bit from this point forward. I will always share a clothing box review of some sort on the first of the month, but it won't always be Stitch Fix. Instead, I plan to rotate which box I feature at the beginning of the month (and I even hope to share a bonus box review mid-way through some months). I love getting these boxes in the mail and I know how much you enjoy reading them, but if I keep going down this rabbit hole, I won't have time to share any other type of content on the blog (and I will probably go broke in the process!) I'm already planning a second review to share with you in mid-October. Stay tuned for more fun … and more sneak appearances from Dessa! Thanks to Erika Christine Photography for another great set of photos. I’m glad your stylist is improving; one of my favorite aspects of Stitch Fix is seeing a stylist come to understand you and your style despite never actually meeting you. I am definitely pinning that Dolman top, by the way! It IS kind of amazing how they can figure people out over time! Looking forward to seeing more of your posts! Good choice of what you kept. My favorite item is the Lidy Cowl Neck Knit Top. I love that cowl neck knit top! It is super cute and looks comfy! This top does a great job of meeting both of those criteria! I like the Breton top! Great decision on what to keep! Love the cowl neck top! I have the Lidy Cowl Nexk too from a fix last winter & love it. It’s so soft & comfy but looks so nice. So great to hear that you still love yours! Thank you! I’ve had it for several years and it is the most-worn watch in my collection! I just want to point out that I have NOT found stitch fix to be good with petites. Seems they are very limited. That’s so disappointing! I remember when they announced the arrival of Petite sizing and it sounded so amazing. I know that they are always improving their size offerings so hopefully better selections will come soon. I loved the red striped sweater, but I understand not keeping an item in October that might be hard to layer (because of the buttons). I know you don’t like TOMS classics but I love them and think that pattern is super cute! Thank you for pointing out that all previously purchased SF items are now tracked on the site! I am always saying to my stylist “another pair of pants like those ones from, like, three fixes ago? maybe four? the black ones!” and hoping she’ll figure it out, haha. Now I can tell her EXACTLY what I’m looking for! I probably wouldn’t have noticed that new feature if you hadn’t pointed it out since, strangely, SF did not make any public announcement (at least, not to my inbox). So, thanks!! It’s the best feature ever, isn’t it?!!? I think I may be even more excited than when Stitch Fix first released its app! I know it’s a feature that they’ve been slowly rolling out so I could see an announcement coming down the road once it’s available to all customers. Kind of a bummer that you only kept 1 item but it looks like they’re finally getting a good grasp on your style and preferences! And I love the top you kept! I love the Breton top. I’ve been looking for a red striped top for a while and may ask for this in an upcoming fix. I definitely agree with your choice in keeping the Lidy Cowl Neck. It looks lovely on you. It was the PERFECT red striped top – definitely worth requesting in a fix! I have yet to try Stitch Fix but I’m always so interested in everyone else’s boxes! I need to get on this! I love what you decided to keep. My SIL is REALLY into Toms and I love their Disney capsule collection, so my only pair of Toms currently has Snow White on them. :) But they are really comfortable! I can see what you mean about feet, though. Shoes are so personal! I like the top you kept, looks super comfy. I love this your fix! Especially the floral shirt!! I’m glad your stylist is figuring out your style. It can be very frustrating at times. Your choice was a great one. I love the cowl neck top! Looks so comfy for chilly Fall Days! It’s pretty much the perfect fall top! They were REALLY good pants! I hope you get them and I can live vicariously through your lifestyle! Cute cowl neck! I love the grey/white top too. Dessa’s onesie is just too cute! I LOVE that onesie so much! Dessa adores dogs so it perfectly fits her little personality. I love you stitch fixes they are always so great. I just got a fix and they included the lidy cowl neck in my fix as well in a purple color. I couldn’t believe how soft it was! I kept it as well! My fave was the Breton Button Detail Knit Top! But, now that fall is here, the Lidy Cowl Neck Knit Top looks mighty comfy! I love all the stripes on your fix! The cowl neck top looks so cozy. Great fix! 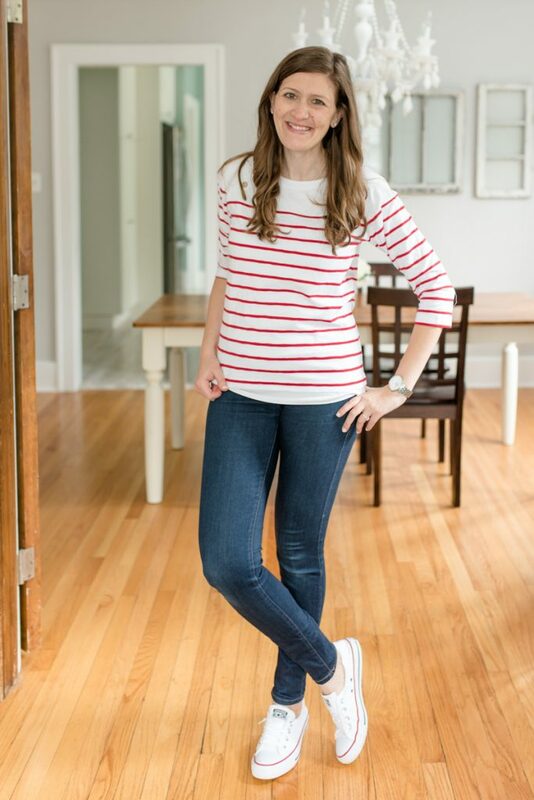 I usually shy away from stripes, but I agree that the ones in this fix were SO good! I have and LOVE the Lidy cowl neck! I have heard great things about Mackinac island… can’t wait to hear about it! 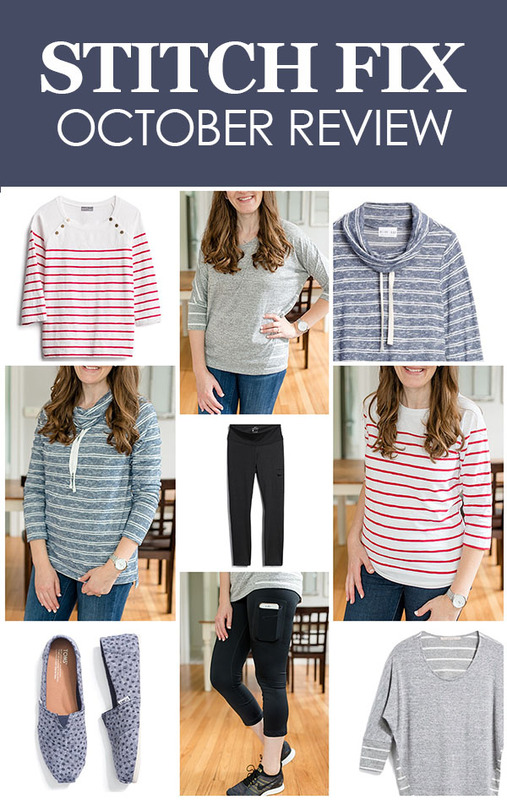 My favorite is the Breton top! I love the Breton Button Detail Knit Top! Pinning that one for my next fix! Thank you so much, Cheryl! I am trying to enjoy every moment. My favorite is the Breton Button Detail Knit Top. You looked great in all the pieces. Thanks for sharing! I always enjoy your reviews. It gives me the thought process for what pieces I should add to or pass for my closet. My favorite from yours this month is the top you kept. I like the first one as well but ultimately the one you kept is my favorite. I didn’t really notice a sheen to the cropped leggings however going into the colder months I would have preferred the long leggings so I thought returning was a good decision on that one anyway. I love Toms but those didn’t really do much for me. You are so right about the cooler months coming! That didn’t occur to me, but after a few weeks, they would be shoved to the bottom of my drawer for six months. I really like the red and white striped top! Thanks for posting these reviews. I am soooooo excited about the My Items feature! It gives you such a good visual of your wardrobe. I used it when I left a note to my stylist about what I wanted in my next Stitch Fix box. I am too! It’s such a helpful little tool. I really like all 3 tops! I am also a teacher, with a 3 year old and an infant, so I’m all about the comfy and casual clothes! Oh goodness, your hands are FULL! Long live comfy clothes! Toms stretch as you wear them, so if you ever decide you want to try them again, make sure they are snug when you purchase them. I really loved the Nike pants! Thank you for the tip! That is so good to know! I kept that same blue cowl neck top from my last fix! Sooo soft and practical for moms! I actually haven’t had a chance to wear it yet since I live in Texas and but hopefully soon! I love the top you chose! The shoes and leggings are also definitely my style though! 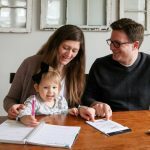 I am a SAHM and would really love to have this exact same fix, it is perfection! Of course, my budget would not agree. 😊 I have been wanting to try a pair of Toms and I really love the chambray coloring. I agree with the majority though, the Olive & Oak is my favorite. It looks so cute and comfy! I love the top you kept as well as the Breton Button detail knit top. I really enjoy following your blog for the fashion portion. I’m not a teacher but I feel like our style is very similar. Thanks for letting me know about the “My Items” section on the Stitch Fix website, it’s helpful for me to see all the items I have purchased. I only started using Stitcfix in July, because I was tired of spending time in stores and not finding quality pieces I liked in small town Vermont. You’re reviews were one of the first things I found when I started researching Stitchfix and trying to figure out if it was worth a shot. I’ve kept something from every box I’ve received thus far, and I always appreciate reading your posts about what you receive as well. Also helpful to see you trying out some of the other companies that do this in case I ever want to try something else. Thanks for letting me know about the “My Items” section on the Stitch Fix website, it’s helpful for me to see all the items I have purchased. I only started using Stitch Fix in July, because I was tired of spending time in stores and not finding quality pieces I liked in small town Vermont. You’re reviews were one of the first things I found when I started researching Stitch Fix and trying to figure out if it was worth a shot. I’ve kept something from every box I’ve received thus far, and I always appreciate reading your posts about what you receive as well. Also helpful to see you trying out some of the other companies that do this in case I ever want to try something else. I love the print of the TOMs! You’re totally right about making your foot look long and skinny. In my case that isn’t so bad because I have short wide feet but it makes finding a pair of classic TOMs hard.